Moonlight: 0.1-30lumens, 2month-5days; Low: 120lumens, 30hrs; Medium1: 500lumens, 7.5hrs; Medium2: 1000lumens, 3.5hrs; High 2500lumens 2h, Turbo 8000lumens; Strobe 8000lumens. 1.When the flashlight is off, one click, access to moonlight mode (left part of the figure), one click to circle: Moonlight - Low - Medium 1 - Medium 2 - High. Long press for light off. 3. 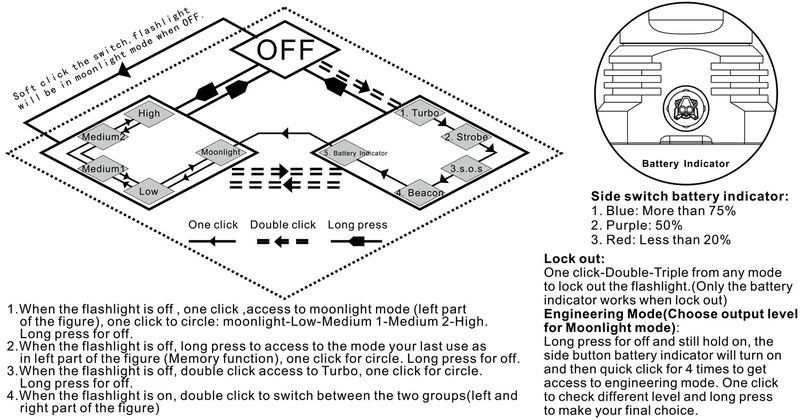 When the flashlight is off, double click access to Turbo, one click for circle. Long press for light off. Long press for off and still hold on, the side button battery indicator will turn on and then quick click for 4 times to get acess to engineering mode. One click to check different level and long press to make your final choice. This is one of the best high lumen flashlights I ever owned. I own 2 MK34-G3s. The customer support is superb. I recommend this flashlight for enthusiasts who look for a high powered torch. I have had this for about a week and I love it! It is well built, compact, easy to use, and ROCKS The Night! I have the XP-G3 version. At times I carry it in my left pocket and it carries well. It does not turn on in pocket. Even if it did...it has the lowest firefly/ultra low I've seen. Two clicks and BAM!! Turbo. This is one of the nicest lights I own. I have NO COMPLAINTS. Battery cell size is tricky. I had trouble with all cells until I robbed a Trustfire. It came with BRC 3800 cells. I must say that I ordered more BRC cells. They work well! I will try the 18650GA's I bought especially for this again but still have zero complaints. You will know when you have the correct size battery because you will "feel" it press into place. You're going to love this light. I bid on a second one ebay and will have two. Handy, Versatile, and just a darn well built light. Click the button below to add the Manker MK34 Flashlight - 12x LED - 3x 18650 to your wish list.